Today, January 11th marks one full week in Cuba. As mentioned in the other blogs, so much has already happened, and we have seen so many different things. But today our lesson was focused on Cuban music. The professor, Ruben, made the class fun and interactive with all the different instruments we were able to use and play. 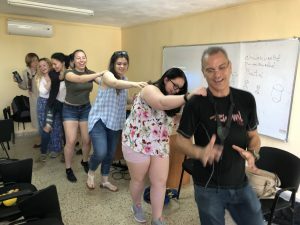 Ruben taught us the history of the different music styles in Cuba, specifically the Punto, Rumba, Conga, Contradanza, Danzón, Mambo, Cha-cha-cha, and Son. In each particular genre/style we started with a brief explanation of its history and then immediately started using instruments to create our own music. We began with the clave (two sticks that are hit together), then added the güido (hollow gourd that you run a stick on the outside), then the maracas, and finally, Ruben would join on his guitar and sing along. Each time was incredible and so fun to hear. Sure, we were not always 100% successful, as some of the beats were weird and different than what we were used to in the United States. Following playing, we also learned the dances that went along with the particular music types. When it came to dancing, the musicality came naturally to some while others had a harder time. But, regardless, everyone enjoyed the dancing and had a fun time. At lunch, we had a delicious Cuban feast (chicken, pork, beans, rice, and a salad, no tostones though so that was kind of sad). But at the restaurant, there was a group that played live music. This was a fun integration of what we had just learned with where we now found ourselves. The musical group was amazing, and a few students even got up and practiced the dance moves we had just learned. Our amazing bus driver, Arturo, helped those students dance along with the music. Following the delicious food, we ventured to another municipality and toured a Health Clinic. The particular clinic we visited was a polyclinic, which meant it encompassed many different specialties (ie. dentistry, psychology, rehabilitation/physical therapy, and emergency services). Being an exercise physiology student, I was very excited to see the facility. Walking through the clinic was a surreal experience. In a way, it felt like I was transported back to the 1950s or 1960s and walking through a hospital in the United States. Obviously, the clinic had all the required machinery (beds, x-ray machines, lab stuff, etc. ), but it all seemed dated compared to what I was used to. It really amazed me how to both the patients and the doctors, they were not hindered by the equipment they had. Following the walkthrough, we all had a short question and answer session with the main doctor and nurse in charge at the clinic. Here we learned even more about not only the Cuban healthcare system but the clinic specifically. Firstly, and probably the most jarring for Americans, is that Cubans have free universal healthcare. Additionally, there are three different levels of doctors in Cuba. Primary being the doctor’s offices or clinics, secondary are the hospitals, and tertiary are specialized institutes. The clinic we went to was at the primary level and deals mostly with prevention and promotion. Also, one student asked about the gender differences in doctors. 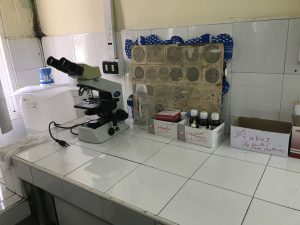 At the particular clinic we visited, there were more female doctors than male doctors, which is very interesting considering it is not like that here in the United States. Also, like every other developed country, children receive vaccinations. But unlike the United States with the small group of people who are anti-vaccine, people in Cuba vaccinate, as it is vital to living and saves lives. It was actually kind of funny since the nurse answering the question could hardly believe that such people existed. On top of that, the two healthcare systems found in Cuba and the United States are polar opposites. In Cuba, it is slow, low-tech, free, but extremely good at ensuring no one slips through the cracks. But in the United States, healthcare is very high-tech but expensive which means a lot of the basics are not dealt with like they should be. But what is most surprising is that the United States has a higher infant mortality rates than Cuba. In the United States, it is 5.9 per 1000 live births, but in Cuba, it is 4. Somehow, despite their older and slower medical practices, Cuba is able to beat the richest country on earth. But regardless of those specifics, it seems like the clinic was another example of Cuba’s time warp. In a way, Cuba has feet in both the past and the present. Its equipment was extremely dated, but its methods and procedures are modern. Just like with the music we learned in the morning, it has evolved from older styles, which are still known today, but continues to change and evolve over time, like so much else in the world. 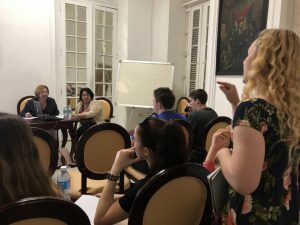 Education for the People Of Cuba: Who Answered the Call? When one asks a Cuban citizen about the accomplishments of the Revolution, one would get responses that include universal healthcare, independence, and most importantly their public education system. Education and the origins of the education system in Cuba would be the overriding theme of the day. 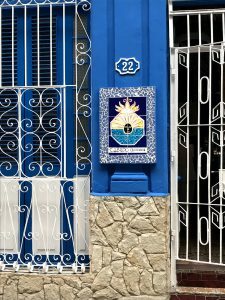 After a delicious breakfast of fresh scrambled eggs, sweet pancakes, refreshing guava, and Cuban coffee we headed to Centro de Estudios Martianos (CEM). This is where we attend lectures on the culture, economy, and history of Cuba during our two week stay. On this particular day, we attended a lecture that focused on the education of Cuba pre and post-Revolution. Before this lecture I had a basic knowledge and understanding of the Cuban education system. I knew that there were some similarities to our system of education, like having public schools and similar grade structure such as kindergarten, elementary, middle and high school. I did not expect, however, to be so intrigued with this particular topic. I was amazed at how the government was able to transform their education system from an inconsistent and disjointed entity into a public and all-inclusive institution that allowed the country’s future generations to thrive. To start off our lesson, we learned there was a huge gap between the public and private institutions before the Revolution. Those who were more affluent and could afford the private institutions, known as the Bourgeois class, were also able afford private tutors to teach their children. This meant they received a far more advanced education than those who attended the public institutions. Since many from the lower class were not pushed to attend school the country’s youth suffered. Illiteracy was also a prevalent issue. This was simply unacceptable to Fidel Castro who made it a priority to fix this education problem that had been ignored by the government under President Fulgencio Bautista. Castro wanted to solve the problem of illiteracy in Cuba and educate the new generation based on the ideals of socialism and their culture. It was of dire importance to the masses he proclaimed. The call was made to the people of Cuba. School towns were made, teachers began to have more jobs, and all the children of Cuba were able to attend school no matter their financial situation. There was now the ability to create schools for those with learning disabilities and the visually and hearing impaired. I was truly fascinated by the progress that was made after the change in power. I enjoyed every second of this lecture and I can attribute the strong interest to this subject mostly to the knowledge or our Cuban professor. Before starting the lecture, she had us make a list of questions we had about the topic of education. I thought this was extremely helpful and, in a way, refreshing. I had never had a professor start a class like this. I also was extremely jealous of the students at the University of Havana because unlike in the United States college is free. Yes, you heard me, FREE! No need to pay to get your degree even if you want to pursue a career in healthcare, like me, which means a lot of payments over many years. After an hour and a half, which seemed to fly by, we headed off to our next destination but not before we stopped for a quick lunch. At this restaurant we were able to have juicy barbequed ribs, white rice, beans, and a little scoop of chocolate ice cream for a snack. 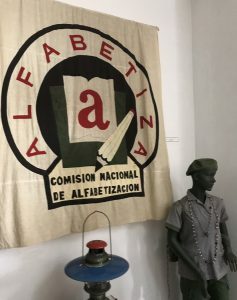 After lunch, we traveled to the Museo Nacional De La Campana de Alfabetizacion (Literacy Museum). We learned about the Cuban Literacy Campaign in which Castro called upon the people of Cuba to help educate their fellow Cubans across the nation. They were to end illiteracy by the next year. According to the museum curator, in 1961 before the campaign commenced the illiteracy rate in Cuba was 23.6%. A year later it dropped down to 3% in 1962. How was this feat achieved one may ask? 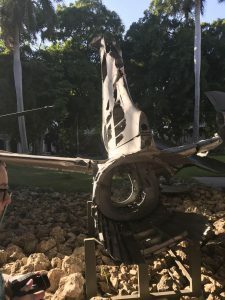 Well it was carried out by young Cuban students and workers. These students answered the call by going out into rural areas and teaching the people how to read and write. For many kids this was their first time away from home. 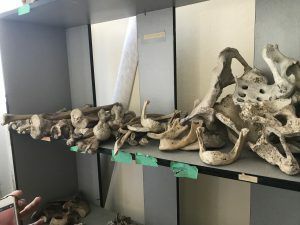 About 100,000 students nine and up, according to the museum curator, went out and taught. It was far different from their lives in the cities and they also had to deal with the danger of experiencing counterrevolutionary backlash.When I was nine, all I had to think about was what snack I was going to eat after school while I watched Full House. Eight of these students/workers were killed by counterrevolutionaries for teaching the people of Cuba how to read and write. To think these students had the possibility of getting killed while helping their fellow Cubans is eye-opening to say the least. It makes you think about your own life and remind yourself how lucky you are to have all that you do. The museum also had on display a chalkboard where gashes were visible from gunshots it sustained during the Bay of Pigs invasion. It was a profound sight to see how large the gashes were and how the original drawings from before the battle were kept on it. Some communities were caught in the crossfire. 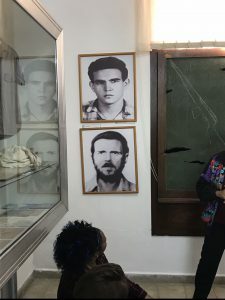 Pictures of the select students and citizens who were killed by the counterrevolutionaries were on the walls. The students were not much younger than my brother, so to see their young faces on the walls and hear about the horror they endured was heartbreaking. There was also pictures of various citizens, including a 102-year-old woman, who had learned how to read and write. Making it to 102 is a huge accomplishment, but being able to have the mind at that age to learn how to read and write is out of this world. It was inspiring to see how a whole country was able to come together in order to achieve such an amazing feat. They wanted to provide their fellow citizens an opportunity to be able to interact in a new way with the people in the Cuban society. One exhibit that stood out featured select letters that the citizens wrote to Fidel Castro as proof of their success. This may not be the most efficient way to prove this huge feat, but nevertheless it got the point across that Cuba was able to increase the literacy rate by 20% of the population in just one year. Cuba has influenced many other countries and has helped them establish these types of literacy programs in their own countries. 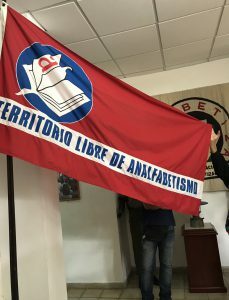 One of the most recent efforts can be seen is Bolivia. The worn streets and plazas are overflowing with activity. As soon as one song fades from our range of hearing, a completely different one takes its place. Stray dogs and cats trot about with confidence. Strong odors, alternating between pleasant and offensive, attack our nostrils. People to the sides either try furiously to attract our attention or gaze at us with mild curiosity. We weave our way through the throngs of people, doing our best to take everything in. Today is our third full day in Cuba. Over the past few days, we’ve explored Ernest Hemingway’s dwellings, been solidly defeated by a local youth baseball team, and gotten a feel for our residential neighborhood of Vedado. Now, we are making our way through the fascinating historic district of Old Havana. I have noticed so many new details that I forget that it is our second journey through this bustling labyrinth of streets, plazas, and alleys. We had started our day at the Centro Estudios Martianos. Like many things in Cuba, this location is tied to the name of José Martí. No one title – academic, poet, revolutionary, writer – is adequate to describe this legendary figure. Though he became a martyr for the cause in his first battle, Martí was the face of the Cuban War for Independence (AKA the Spanish-American War) and a hero among Cubans. We have already encountered his image more times than I can recall. 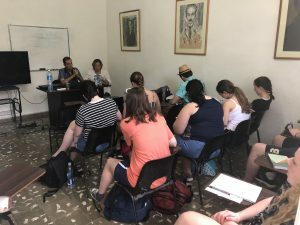 In a small yet comfortable classroom (which featured no less than four of these images), our guest lecturer provided a brief overview of Martí’s life and work. The speaker emphasized his humanist perspective and universal value of his writings. 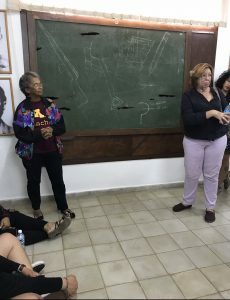 As she admitted herself, however, explaining the importance of a man so central to the Cuban identity is an impossible goal for a single lecture. Following the lecture and a coffee break, we dined at a paladar, a private restaurant sustained primarily by the business of tourists. These venues tend to provide far superior food and service compared to the state-run restaurants. 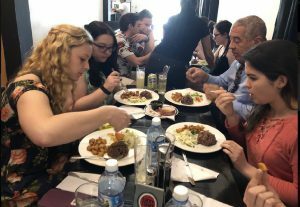 Today’s lunch was among the best meals we’ve had so far, featuring typical Cuban cuisine: rice, beans, fried plantains, chicken, and ropa vieja, a signature dish consisting of shredded beef. Later, our plans to visit Martí’s memorial were thwarted by an issue with the site’s electricity. Such unforeseen problems in Cuba are not uncommon, and adapting to them is a part of the experience of living here. In keeping with this spirit, we had been released to explore the city independently for the remainder of the day. Here in Old Havana, I find that my eyes are continually drawn upwards, enticed by architecture that remains beautiful despite its age. No two buildings are the same. Intricate columns and etchings are prominent not only on churches, but also on businesses and residences. Many buildings are covered in solid coats of paint, some of which have been bleached by the intense sun. Staircases, facades, and balconies jut into the straight streets. We frequently spot the Cuban flag suspended proudly above. With every sighting, I am gradually realizing that Cuban patriotism rivals that of the United States. Our return to the logical grid of Vedado is just as stimulating. Every zone we’ve entered has been packed with points of interest. As we near the edge of Old Havana, we find ourselves in the vicinity of the capitol building, the Great Theatre of Havana, Hemingway’s favorite bars, and the former Presidential Palace. 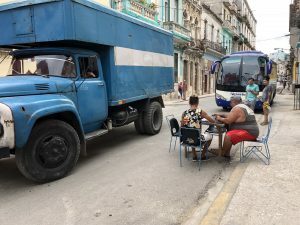 Here, the wider streets are shared by large tour buses, horse-drawn carriages, ancient cars, and anything that fits Cuba’s loose definition of “taxi”. 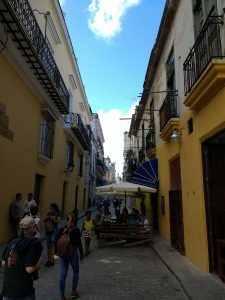 Later, the route takes us along the Malecón, the sea barrier that extends for miles along the coast and is informally known as “the city’s couch”. Despite the nearby skyscrapers and busy roads, Cuba’s natural appeal is as strong as ever here. Pelicans soar through a brilliant blue sky. Waves hurl themselves against the base of the Malecón with such ferocity that spray leaps over the wall. Lush tropical plants frame the sidewalks and buildings. It is easy to see why the island was a top tourist destination in the years leading up to the sweeping Cuban Revolution. As we approach the recently-reopened U.S. embassy, Martí makes yet another appearance. A dramatic statue of his unmistakable figure stands several hundred yards away from the imposing building. With one arm, he shields a young child; with the other, he raises an accusing finger towards the embassy. The scene is a reminder of the complicated, often-antagonistic relationship between the island nation and its northern neighbor. With the Cuban War for Independence, the island prevailed over Spanish imperialism only to face a new challenger in the United States. 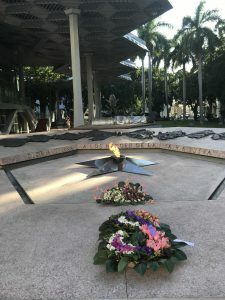 Hostility between the two countries reached a maximum sometime after Fidel Castro’s Communist revolution, and the U.S. embassy remained closed for most of the Cold War and beyond. Its reopening less than four years ago was one of many landmark strides made by President Obama and Raúl Castro. Today, however, lingering political differences, thorny issues, and President Trump’s apparent indifference towards Cuba have given the nations’ relationship an uncertain future. Perhaps this unusual history with our own nation explains my unusual feeling; exploring Cuba feels like exploring something forbidden. It is a country that has only recently opened up to the U.S., one that is just starting to pick up technologies that are commonplace for us. Strange as it is, this feeling is overwhelmed by my excitement. The city’s undercurrent of energy is palpable both night and day. It beckons us to explore, and we heed its call almost feverishly. Though it is impossible to experience everything it has to offer, I am certain that Cuba will continue to amaze me in the coming days. Today was a day full of history and life. Our day started in Old Havana. Early in the morning, our reliable and personable bus driver, Arturo, dropped us off at the mouth of Old Havana, which also happens to be next to the mouth of the Port of Havana. From there, you could see countless remnants of the Spanish colonial empire that used to exist there. Across the waterway, we could see a colossal stone fortress that seemed to extend for hundreds of yards. In the Plaza de Armas, we were surrounded by a church, an old castle, the former palace in which the Spanish colonial governors would live, and a lovely garden in the square. As we got closer to these only monuments, the footprint the Spanish had left behind became more and more apparent. 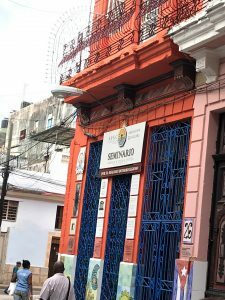 Not only were these buildings European in their architecture, but the artwork they held was of Spanish conquistadors and Christian missionaries; things that were not native to Cuba before the Spanish arrived. I was impressed with the degree of preservation the Cubans were able to achieve with the buildings. 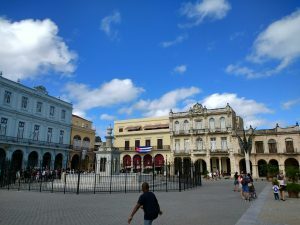 Some of the buildings were hundreds of years old, but it was very apparent that the Cuban government took a lot interest in assuring that the buildings stay around for people to see and appreciate. As we began to walk through the rest of Old Havana, we immediately sensed that we were walking through a time machine. As hinted by the name, Old Havana had a lot of old buildings. Many were in disrepair, and a lucky few looked like they likely did when they were built. One of those buildings was a hotel in which Ernest Hemingway spent countless nights in Havana before finally settling down in a house not far from the city. Five stories tall, with a rooftop bar, an old-fashioned elevator, and a lovely open floor plan, the building was painted bright pink and was a popular tourist attraction. A quick side note: Cubans really like Ernest Hemingway. 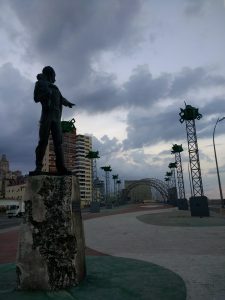 There are countless paintings and monuments to him throughout Havana. 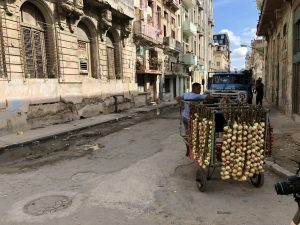 Continuing to walk through Old Havana, it became clear to us that the economic situation in Cuba is not up to standards with what we Americans were used to. One cannot walk 50 feet without seeing a tiny derelict shop selling the same exact stuff as the shop next to it. The shop keepers are constantly calling out to try to attract business. The restaurants were similar; there would be salespeople sent out sometimes over 100 meters from their restaurant to try to pull tourists in from busy streets. There were countless beggars and stray animals. 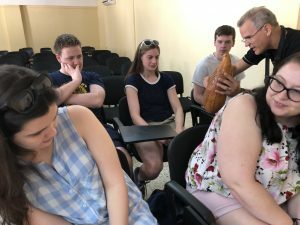 There are many people struggling to make ends meet in Cuba, which made it hard as a tourist because there was an expectation that I always had money to give. After a long stroll through Old Havana, we then took another long stroll through the neighborhood that surrounded our residence, known as Vedado. Vedado can be thought of as the Cambridge of Havana. It is almost at the heart of the city, but it is a quiet pocket of residential neighborhoods which, as with the rest of Havana, varied from literal piles of rubble to beautiful Spanish colonial homes. Must like Cambridge, Vedado is somewhat of a cultural hub with a lot of underground bars and music scenes. For example, Arturo dropped us off in a park with a statue of John Lennon, which is conveniently next to a night club known as the Yellow Submarine. Between Old Havana and Vedado, we took a short stop in a giant place known as Revolution Square. It is a huge open area surrounded by government buildings, and, at its center, is a 109m tall tower with a statue of Jose Marti, Cuba’s revolutionary founding father. On the walls of the surrounding buildings are the faces of Che Guevara and Fidel Castro. I was impressed with the scale of the place; it truly was vast. I was also struck by how Cubans were so proud of their revolution. I appreciated the strong sense of national identity that Cuba felt despite the challenges they faced as a small Caribbean country that was bullied by the United States. To conclude, seeing the evolution of the Revolution from the early days of Spanish colonial era to resisting the United States was fun to witness in one day. 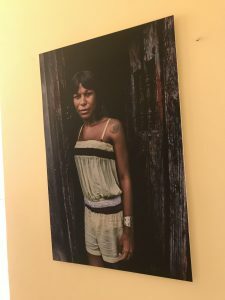 Cuba maintains an eclectic cultural balance embracing and displaying their past while also demonstrating a strong will to pave an independent path for themselves. I woke up early, tired from the long day of travel that started when I left my house at 8:00 am the day before and ended around 12 hours later when we finally reached the residencia. We awoke to our first day in Cuba at 8:30 to a delicious breakfast of pancake like saucers with a fruity syrup that was complemented by the bounty of fresh fruit and freshly made bread that adorned the table. We followed breakfast by collecting the items we required for the day. For the first day, this included a variety of baseball gear that we brought to donate to Cuban kids who play little league baseball. 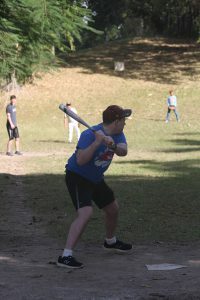 After a short bus ride, we reached a small dirt clearing with patches of grass where there were Cuban children practicing baseball with their coach. As one of the island’s heroes, Hemingway donated more than just the cultural significance of his writing and his estate to the Cuban people; he also created a little league for the Cuban kids in Havana and gave the league some of his land to play on. I was struck by the impact that our simple gifts of a few pieces of equipment, some baseballs, and baseball cards had on the kids. The enjoyment that they derived from practicing baseball with each other and playing against us was touching. I remember when I was their age, that all the kids would want the best equipment, and towards the end of my own baseball career, some of my teammates would spend hundreds of dollars on bats. Meanwhile, the Cuban kids seemed to be grateful that they had any equipment, and they played with gloves that would have been thrown out long ago in my town’s little league. The grace with which the players managed to navigate the field and their ability to predict the movement of the ball on such a non-level surface was impressive, especially given that two of our group tripped on the uneven ground and fell while trying to field balls. Watching the joy spread across each child’s face as they hit or fielded a ball numbered among the best experiences, I had the entire trip. After playing baseball with the kids in Hemingway’s still operational little league, we were given the opportunity to tour his house. 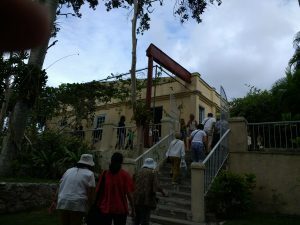 We had the unique opportunity to look in on Hemingway’s daily life for the 20-year period that he lived in Cuba. His house was extremely well preserved, and still contains all the original books that were in his personal library as well as the notes that he took on his height and weight on his bathroom wall. His numerous trophies from safaris in Africa were a testament to his outdoorsmanship as well as his nature as a world traveler. Also on display at Hemingway’s house were various works of art with him as the subject, and his famous boat, the Pilar. Hemingway loved Cuba, hence it being his home for longer than any other place that he stayed. Hemingway’s time in Cuba ended up being longer than any of his four marriages (his longest marriage was to Mary Welsh for 15 years, and he lived in Cuba for twenty-plus years). Ernest Hemingway may well have been the single person who most closely represented the essence of Cuba, even more so than many of the nation’s founding leaders. Hemingway enjoyed traveling and bringing different parts of different countries back from his travels. He also incorporated all his experiences and all that he learned in his many travels into much of his writing. Cuba’s essence as a mashup of Caribbean, native, south American, north American, European, and African cultures, in addition to a small Chinese influence is close to the mashup of experiences that influenced Hemingway’s life and writing. 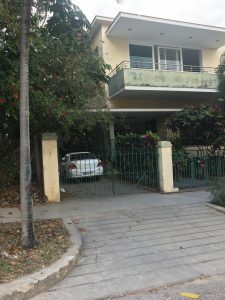 Our walking tour of the Vedado neighborhood where our residencia was located was unfortunately delayed until the next day due to concerns about the weather. 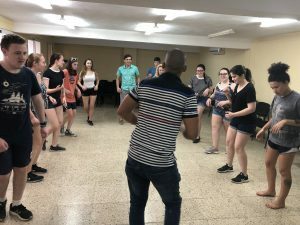 One of the experiences we got to have instead was wandering around the neighborhood in our group and having the opportunity to have authentic interactions with the Cuban people. We were able to buy some souvenirs during this time, and one of the experiences I had while souvenir shopping will stick with me for the rest of my life. I tipped a couple 5 CUC, which is about equivalent to 6 USD for wood burning some writing into a pair of wooden cars that I bought as gifts. To me, the 5 CUC was almost nothing; that’s about how much I make in about 25 minutes of work, but to the couple that I bought the cars from, it seemed like it was a Godsend. They jumped up and down with joy and continuously thanked me for my generosity. I thought nothing of it at first, but then when I thought about it more, I realized that what I gave them was equivalent to almost one quarter of their government mandated monthly salary of around 20 CUC. When I did the math out, I was amazed to realize that the money was worth about 120 times more to them than it did to me. To me, that was a mind-numbing statistic that made me realize the extreme poverty of Cuba, even more than what I saw of the infrastructure there and more than what I saw of the condition of the people and their lives as I walked in the streets. The event that wrapped up the day was the welcome dinner at one of the restaurants that Obama dined at during his 2016 trip to Cuba. 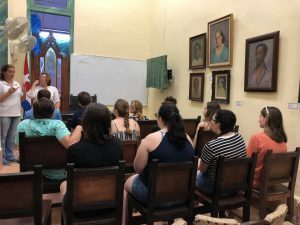 It was a very nice experience that brought us all closer together for the rest of the trip and gave us the opportunity to sit down with everyone and debrief after our first day in Cuba. It was also eye-opening to see how much Obama’s visit and his attempt to normalize relations with Cuba was appreciated by the Cuban people. 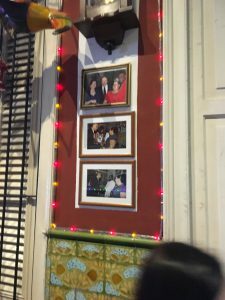 There were so many pictures of him and the owner around the restaurant that it had the appearance of being an Obama-themed restaurant. 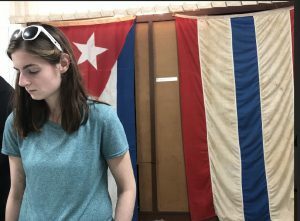 It touched me to know how much the Cuban people are willing to look past the differences between our country’s governments to reach out to us and other Americans as people rather than members of an opposing nation.